How To Maintain CNC Machine Tools? Its main projects include hydraulic systems, spindle lubrication systems, rail lubrication systems, cooling systems, and pneumatic systems. The daily inspection is based on the normal conditions of each system. For example, when performing the process detection of the spindle lubrication system, the power light should be on, and the hydraulic pump should be running normally. If the power light is not bright, keep the spindle stopped and contact the mechanical engineer. Carry out repairs. The main items include machine tool parts and spindle lubrication systems, which should be properly inspected weekly, especially for machine parts to remove iron filings and external debris cleaning. Mainly to check the power supply and air dryer. The power supply voltage is rated at 180V-220V under normal conditions, and the frequency is 50Hz. If there is any abnormality, it should be measured and adjusted. The air dryer should be removed once a month, then cleaned and assembled. The quarterly inspection should be carried out mainly from three aspects: machine bed, hydraulic system and spindle lubrication system. For example, when inspecting the machine bed, it is mainly to see whether the machine tool accuracy and machine tool level meet the requirements in the manual. If there is any problem, you should contact the mechanical engineer immediately. When inspecting the hydraulic system and the spindle lubrication system, if there is any problem, replace the new oil 6oL and 20L separately and clean it. After half a year, the hydraulic system of the machine tool, the spindle lubrication system and the X-axis should be inspected. If there is a problem, the new oil should be replaced and then cleaned. After thoroughly familiarizing with and mastering the knowledge of preventive maintenance, you must have a deeper understanding and necessary grasp of the causes and treatment of abnormal phenomena in the hydraulic system. For example, when the oil pump does not spray oil, the pressure is abnormal, there is noise, etc., you should know what are the main reasons and what is the corresponding solution. (1) The main reason for the oil pump not to be injected may be low liquid level in the fuel tank, reverse oil pump, low speed, high oil viscosity, low oil temperature, filter blockage, excessive suction pipe capacity, and suction at the oil inlet. There are damages to the air, shaft and rotor. For the main reasons, there are corresponding solutions, such as filling the oil, confirming the sign, and changing when the oil pump reverses. (2) The pressure is abnormal. The pressure is too high or too low. The main reasons are also various, such as improper pressure setting, poor operation of the pressure regulating valve coil, abnormal pressure gauge, and leakage of the hydraulic system. The corresponding solution is to open and clean according to the specified pressure setting, change to a normal pressure gauge, and check according to each system. (3) Noise There is mainly noise generated by oil pumps and valves. When the valve is noisy, the reason is that the flow rate exceeds the rated standard, and the flow should be properly adjusted; when the oil pump has noise, the reason and the corresponding solution are also various, such as high viscosity of oil and low oil temperature, solution To raise the oil temperature; when there are air bubbles in the oil, the air in the system should be released. 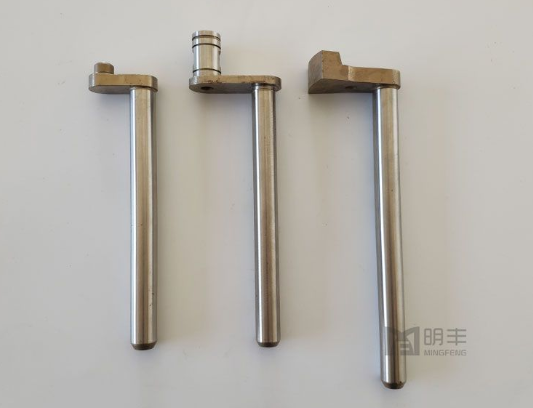 Our company provides CNC Machining Gear Shaft Parts. Welcome to contact us. Next: How Many Ways Does The CNC Machining Process Be Divided?